My jaw almost hit the floor. Me? Calm? TOO calm!? In the present circumstance, I was feeling a whirlpool of turbulent emotions. So was the guy on the other end of the phone, who had been alternately yelling, crying, and swearing at me. Yet I—someone who normally wears her feelings on her sleeve and sheds tears over every little thing—kept my composure throughout the conversation, despite his attempts to bait me into having an emotional reaction. There’s nothing wrong with emotion. Feelings are a normal part of life, and expressing them is often what makes us real. Yet “losing it,” especially in a professional setting, can impede your ability to think clearly, reduce your credibility, and come across as emotional blackmail. Whether you tend to be a yeller or a crier, learn to keep your emotions in check in order to preserve your reputation, increase your authority, and accomplish your goals. It’s so simple, yet so hard. Take one moment—it only takes one!—to pause. This tiny act of deliberation sends a message to yourself that you are in control of your responses and to everyone else that you aren’t easily knocked off-balance. In his book, The 7 Habits of Highly Effective People, Stephen Covey referred to the “gap” between a stimulus and your response. Acknowledge that “gap” with a pause and everything will go better. Deep breathing releases chemicals of calmness into your system. Exhaling gets toxins out of your body, allowing your whole system (and brain!) to work better. It gets you out of fight-or-flight and quiets your emotions. This communicates presence and confidence. Do this both physically and mentally. Location holds memory. Shifting out of the spot where your emotions started to escalate can sometimes be enough to get them under control. And while you’re at it, step back mentally. What’s the big picture? How will an emotional outburst come across? In 10 years will you think this is worth getting upset over? What happens in the brain happens in the body, and vice versa. An emotional outburst is often foreshadowed by the corresponding facial expressions. 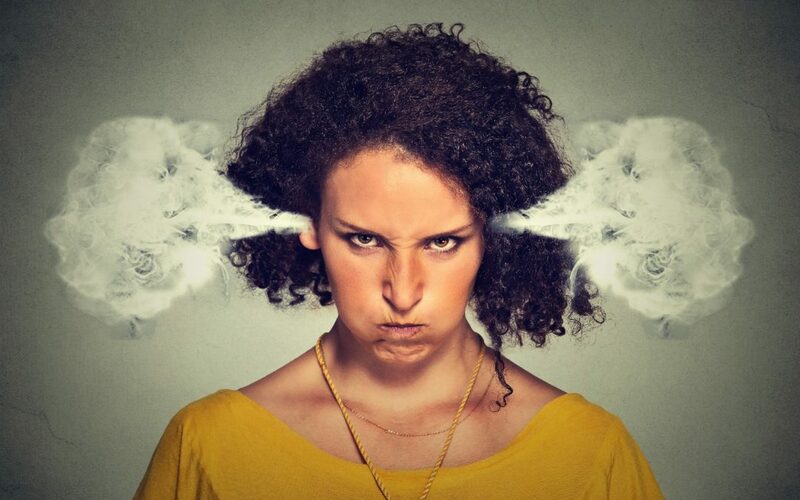 When you consciously override those expressions, not only do you reduce the negative nonverbal cues you are sending out, but you change the way your brain processes the emotion. A great way to get out of your head (and feelings) is to get into your body. This grounds you in the present moment and the current reality, reminding your brain that your survival is not actually being threatened. The “54321” method for reducing anxiety and dealing with panic attacks can also help reduce overwhelming emotions. Personally, when I’m feeling emotionally overtaken, I remind myself to feel my feet. That immediately gives me access to my entire body from head (where the thought originated) to toe and I feel the ground beneath me. It’s a small thing, but it forces you to pause, step away, and get into your body. Water also literally cools your system, improves your mood, and helps you think. Once you’ve gotten through the situation without losing your temper or erupting into a fountain of tears, you need to deal with the internal aftermath. Whether it’s immediately afterward, or later in the day, get those emotions out of your body. Move, exercise, go for a walk. Tell someone about it. Write it out. Punch pillows or yell in your car. Knowing that you CAN and WILL have an opportunity to vent all that emotion will make holding off in the moment that much easier. Not to mention, it’s good for you! You can’t (and shouldn’t!) stop feeling. It’s all about how and whether to express those feelings. Sometimes it’s not in your best interests to let it all out. Intense emotions hijack your brain, and that can make you look, feel, and act unprofessionally. Instead, stay present and grounded, and communicate on purpose.